From time to time Nordic4DFrame will have newsworthy items that we would like to pass along. They are listed in chronological order with the most recent ones first and the oldest ones last. "Enlightening Imagination" is a competition to encourage students to solve problems and put their ideas into practice in a creative way with the help of 4DFrame; an educational teaching material developed in South Korea. Each team, consisting of two students, receives a well-defined mission. The goal is clearly formulated and the evaluation criteria are based on technical solutions, creativity, artistic level and interpersonal skills. The assignment has to be solved in 1.5 hours, and will be presented as a short description, a simple sketch and a 4DFrame model. Each group will describe and demonstrate how they have used their technical and mathematical thinking. 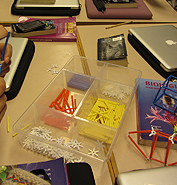 Two scholarly articles published in educational journals last year (for citations, see after the text) have shown that a traveling science centre exhibit that included a 4DFrame hands-on workshop showed a real increase in student learning in such an informal educational setting that were better than expected. Data for the two studies came from the “Discover the Art of Math” (DAM) exhibit that was traveled to several science centers in both Latvia and Sweden. 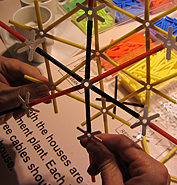 Each installation had its own 4DFrame workshop where exhibit participants—both from visiting school classes and the general public—had the opportunity to use the material. In the case of these two articles, nearly 800 12-year old students—almost equally divided between boys and girls—took part in a program of pre- and post-visit testing in association with their visit to the DAM exhibit. The actual time spent in the exhibit itself was divided up into two parts; the first consisted of 45-minutes among eight interactive “hands-on” exhibition objects that the students were allowed to explore and interact with on their own and in their own way during the allotted time. Following this, they spent 45-minutes in the 4DFrame workshop part of the exhibit building their own three-dimensional structures and creations using this educational material’s colorful multi-length tubes and different types of connectors used to attach the tubes to one another. One of the things that they could perform was to build concrete geometrical models and other physical structures based on abstract instructions; for example, build a 3D box based on starting off with a 2D square. While much has been written anecdotally about the value of informal learning in such places as museums and science centres (even planetariums), there has been little, or no, evidence from formal studies that education in such venues has taken place. One of the important outcomes of the post-visit tests from this study does in fact show that learning actually had taken place in DAM in such informal learning situations. Both boys and girls—there was no gender difference in the results—showed an increase in what they knew immediately after visiting the exhibit as well as following a period of time (about seven to 11 days depending on the class) when the experience was no longer current. Another interesting outcome was that those who had the poorest results in the pre-test actually improved their results on the post-test, a clear indication that informal learning can be a valuable tool for providing learning opportunities for the weakest learners who may not respond well in a traditional school setting. It could only be hoped that after being inspired by the improvements gained, and their increased self-esteem following their visit to the informal learning environment of a museum or science centre, that they would find new interest in their school’s more formal setting. In the final analysis, the results were encouraging enough to continue along these lines in future investigations on the effectiveness of educating via informal learning environments. And the use of 4DFrame educational materials in such a setting certainly played a part in motivating the student’s natural curiosity as well as their aesthetic sensibility, leading to higher interest and learning for both boys and girls. - H. Salmi, M-P. Vainikainen and H. Thuneberg (2015). 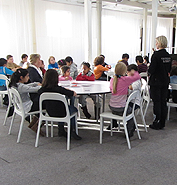 “Mathematical thinking skills, self-concept and learning outcomes of 12-year-olds visiting a Mathematics Science Centre Exhibition in Latvia and Sweden” Journal of Science Communication 14 (04), A03.